industrial sites, established warm season turf. annual grasses and many broadleaf weeds. 1,000 sq. ft. Turf; 1 – 1.5 oz. per 1000 sq. 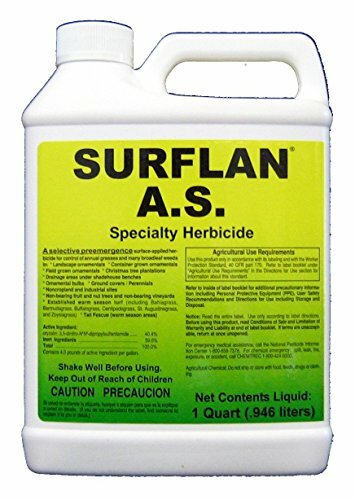 ft.
(Do not reseed for 90 – 120 days following application). in sufficient water to cover area. Oryzalin 4 is intended for use on landscape ornamentals, bulbs, christmas tree plantations, warm season grasses, and vineyards. Mix 3oz of Oryzalin per gallon of water to treat 1,000 square feet.